It’s only a month later than I had originally planned but as of Sunday, I’m finally out of my storage unit. That’s a savings of a little more than $2800 a year. Unfortunately, since I’ve moved the items into my garage I have now have no room to actually park my car. So now my Beamer sits outside in the weather. I guess I’ve got a new incentive to get the suspended shelving up in my garage as the longer it doesn’t get completed, the longer my sports car sits in the Pacific Northwest winter weather. I’m also incentivized to sell off some things I no longer need like a bow flex, an antique iron bed, some tires, a portable air conditioner, and a pair of 10-speed bicycles just to name a few things. My son tells me to list them on Craigslist. But I’ve not done that before so hopefully it’ll work out that I sell all the unnecessary items. My goal is to have these no longer needed items gone by the end of the year. I wonder if that’s even possible. All last week, I made myself leave work at a decent, normal time so that I could finish my home projects. 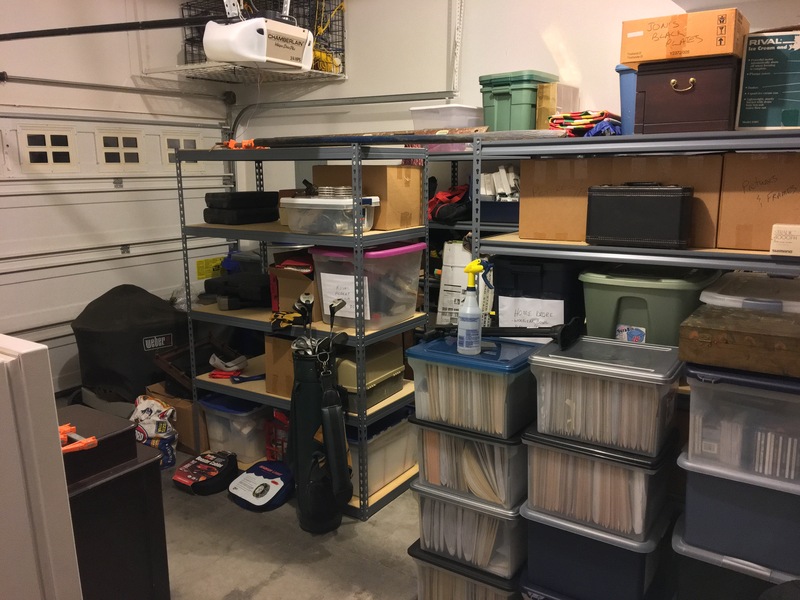 I need to complete my garage storage project. Well that was the plan. But of course that didn’t happen. I left work late most every night and consequently did not work on my garage storage project. Two weeks prior, I completed the lagging in of the 2×4 boards that act as cleats from where the shelving units would be suspended. I still had three units to hang. This past weekend, I spent it with S so did not work on my home projects. So maybe I’ll be able to complete or at least continue. On thing I promised myself is to not start on any other project until the garage storage is completed. 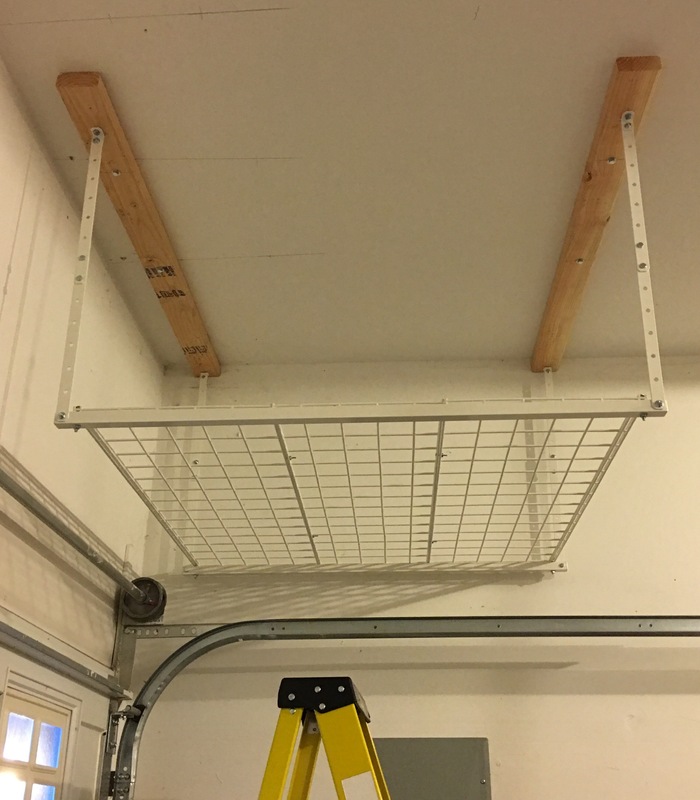 Its been a few weeks since I started the suspended shelving garage storage project. I’ve been too busy at work during the week that I’ve been averaging 12 hours throughout the weekdays leaving little to no time in keeping my house let alone any additional work. As part of my OCD tendencies, things have to be put out of the way and not cluttered before I can work on other projects. Although I must have all things in its place, I’m able to have multiple projects occurring in parallel as long as I can ensure all the clutter and mess caused by the multiple threaded projects is removed as a stopping point is reached. That’s why the suspended shelving project in my garage has spanned several weeks. As I approached the end of the allotted time, I have to bake in the clean up effort and time to put my tools back where they belong. I cannot leave them out. This past Sunday, I devoted a very small part of my day to continuing the suspended storage shelving. It was Sunday so not much motivation to push hard. But I did complete the lagging in of one of the last 2×4 cleats where the suspended shelving would hang. Although I didn’t get much of the shelving project completed it’s still progress. As my high school football coach told me “you win by gaining every inch you reach.” So the adding of one of the final 2×4 cleat gets me closer to completing the garage storage project. Lagging in the last 2×4 cleat, hanging the three remaining shelving units, and organizing the seasonal decorations into each suspended unit will wait until I can get to that step in the process. Next month I’ll have to retain the storage unit and dole out another $200. The month of my one year anniversary of being in my new home is here. I gave myself until the end of the month to be completely out of my storage unit. Of course, nothing bad would actually happen if I didn’t. It’s just a $200 a month I would be saving instead of giving it to a storage company. So I guess the incentive is $2400 a year back in my retirement / investment account. Should I bring everything home? So part of the goal is to also sell off things that I really don’t need or want anymore. Take for example my bow flex. I’ve probably used that machine a few weeks in the five years I’ve had it. Worse thing is I’ve moved it twice already. It’s traveled with me to a townhouse after my house that I owned with me ex was sold. Then it traveled from my townhouse to my current house I’m buying and sits upstairs collecting dust. I was crazy to have my movers move it upstairs and reassemble the damn thing. It’s got to go! I also have two 10-speed bicycles. One is a schwinn and the other is a huffy, which I bought in a garage sale thinking I would fix up. Yeah right! Then I go and buy me a road bicycle a few months ago because I wanted more than ten speeds. Both my old bicycles got to go!! I’ll have to bring them home and temporarily store things in my garage and living space as I SELL them off on Craigslist. Oh crap! I’m a closet hoarder!!!! The kids were back home and S and I were in bed by 1AM. She set her alarm for 6:30am to be ready for her girlfriend trip the next morning. My plans were to go back to my house and work on my own house projects. The one I need to finish is the overhead garage storage that is suspended from the ceiling. I debated on staying at S’s house as there were a house full of kids. I guess her kids were okay and accustomed to having their mother do things with her adult friends and leaving them to fend for themselves. They are teenagers so I guess that’s okay. I mean when I was a teenager I remember not wanting to do things with my parents. I debated on staying to be the adult in the house, but I’m not sure I’m mentally there yet. If I had stayed, I would have made the kids breakfast before I took off for my house. But I didn’t and left the same time as S did, which as about 7:30am. I was back home around 9am after stopping off to get breakfast and collecting my mail from my PO box. I decided to watch the Pittsburgh Steelers game on TV. I typically don’t watch them as when I do they lose. My superstition is to not watch them but only to check out the score every now and then. However since I was wearing Pittsburgh Steelers black and gold, I ignored my rule and watched them. Luckily they didn’t lose. Prior to turning on the ballgame, I negotiated with myself that I would work on my suspended storage shelving after the game. Staying true to my promise I resumed my garage storage project and nearly completed lagging in the support beams that are to hold the suspended shelving. There’s a difference in the way S identifies and prioritizes her house projects than I would. For me, what I see daily needs to be cleaned and functional before other areas of my house takes priority. As an example, my bedroom and master suite needs to be tidy and clutter free. This is the same for my kitchen, my living / dining rooms, and my bathrooms. It must be my mom’s upbringing that instilled this behavior. For S, her priorities were not her main living areas. Her first priority was her garage. It’s no shock her kitchen, her bathrooms, her living and dining rooms were always cluttered. Her master bedroom is huge but you can’t tell as she has piles of clothes (not sure if they are clean or dirty), piles of shoes, and other piles of things she hasn’t touched since I was there last. I’m tempted to clean up her room, but I’m sure she’ll freak out as she’ll not know where things are…not that she knows where things are now. For this past Saturday, one of her projects were to have shelving up above her overflow fridge in her garage. Now last week we removed the overhead cabinets. She also planned to finish painting her upstairs office, and to weed her front flower bed, and somehow get time to see the new Magnificent 7 movie. I woke up early Saturday and got myself ready as S slept in. After she got raady, we ate breakfast out, and then ventured to the local home improvement store and bought the shelving. We had a hearty breakfast and we both felt sleepy after breakfast while we were shopping for her garage shelving project. I worked through the lethargic feeling and found my second wind. Apparently, S couldn’t recover and decided to nap when we got back to her house. 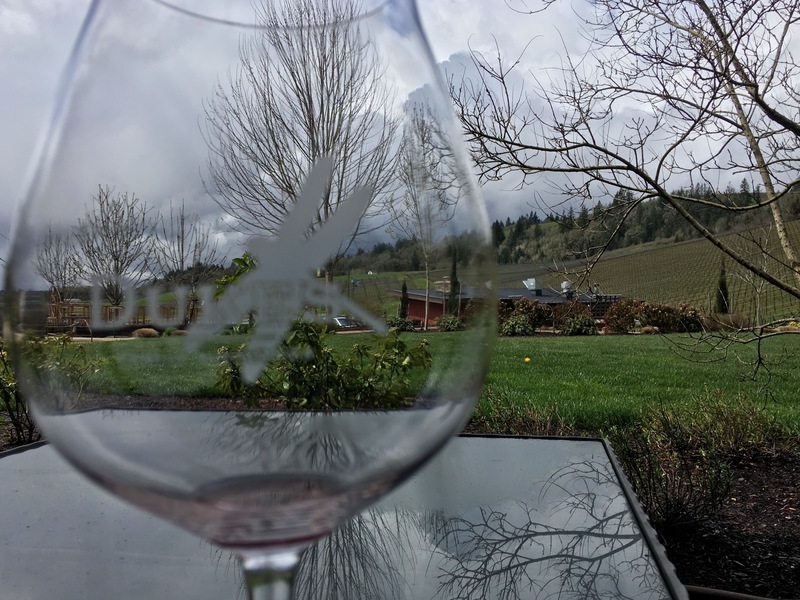 The other things on my list was to hang her stained glass window, which was an item from three or four weeks prior when her sister was visiting, and winter proofing the irrigation system. When I got back to her house, her car was in the drive, but I didn’t go looking for her. I continued and completed the shelving project. I was done about an hour later, which was around 1:30PM. Next on my list was hanging her stained glass window. I previously bought open hooks that screwed into the top window frame. It only took 5 minutes, if that, to complete that task. S was on the phone talking to somebody. Didn’t bother me any but another confirmation that her list would not get completed. My project #2 was done. On to my third project for the day. This past summer, I created a temporary irrigation system to water her raised vegetable garden as well as her front flower beds. The temporary irrigation system had battery powered valves that controlled when and how long water was to flow. It worked well and kept the two zones watered during the warm summer months. Here in the Pacific Northwest, we don’t need year round irrigation system as the wet season starts late September and ends in June the following year. Thus a temporary irrigation system does the job nicely. I disconnected the brains of the watering system and removed the batteries from the water pumps. Project #3 done. It was now a few minutes after 2PM. I reminded S it was 2pm and it was time to get ready for the movie. She disappeared upstairs to shower and change into non weekend work clothes. The tree trunk I just bought was just the tip of this man’s incredible inventory. Jackie spotted a couple of boards that grabbed her attention and started her negotiations. It was great seeing someone like me working to get a good deal. Actually it’s not hard work as this guy’s prices were incredibly low that I would feel guilty trying to get even a lower price. In fact this is the first time that I’m not haggling. Jackie doesn’t move as fast on the deal as I do and we continued to dig deeper into his inventory and walked through a gated fence to his backyard, which were also sectioned into different areas depending on the wood. He had great material for shelving. My mind wasn’t seeing what I needed in other areas in my house but instead focused on a block or a beam for my dining room chandelier. He had something close but not one that I had to have. As Jackie and I maneuvered back to the front of his house, I saw the birds eye alder again but from a different angle. It was magnificent specimen of an awesome tree. I’ve not seen a birds eye alder before today as I’m from the South and accustomed to seeing bunches of quarter sawn oak, pine, and mahogany. An occasional walnut or poplar might be spotted and in rare and lucky instances, a furniture piece made of birds eye maple might be seen, but never a birds eye alder. 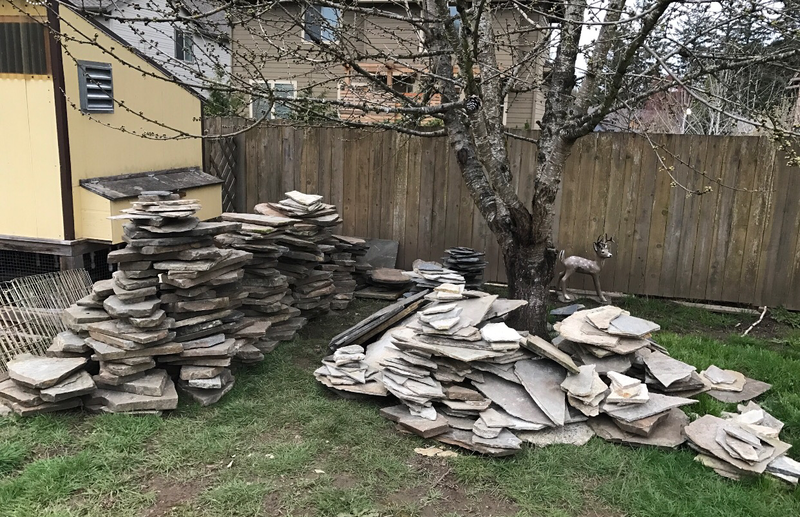 As I was pointing and grabbing for the birds eye alder, I asked, “how much for this piece?” He thought for a second and responded, “$10.00.” I stuck my hand out to shake on the deal as my jaw dropped open. “I’ll take it!” I said. I could believe it, I just bought a plank of birds eye alder measuring approximately 5′ tall and about 24″ wide for $10.00. My total came to $110.00. Jackie and I have several things in common and you would think we had grown up together the way we are when we’re together at work or outside of work. Now Jackie, like me, enjoys working on projects that requires the use of power tools and other hand held craft wielding devices. One of our first ventures were taking a welding class together. We both loved it and both of us are itching to get our hands on a good used line fed welder. Our adventure last Thursday was finding a supplier or just a reasonably priced seller of live edge wood. For those that do not know what is live edge wood, this is milled wood that still has its bark or it has the outermost layer of the tree just under the bark. I have several lighting ideas for my house and I think I want to incorporate in my design a wooden object with a live edge. We left work and headed to the address of where this man is selling his live edge wood. I was expecting a farm like setting with a barn. Quite the contrary. We ended up in a subdivision and he was selling this wood from his house. He actually sells his wood across the nation. I think he said he had shipped outside the country even. I was amazed at both his story and his inventory of live edge wood planks. I literally could have spent hours combing through the many boards he had. Each board were unique in that the patterns were one of a kind and would completely differ from another piece cut from the same tree. After about five minutes after our initial introductions, I spotted a piece of wood that had a very unique pattern. It was a section of a trunk from a spalted maple. It was incredible and measured roughly 3.5 feet in diameter and about 8″ thick. So it was a sizable item. We talked about the piece and I learned the intricate designs found in the spalted maple are caused by various and different fungi growing in the tree. I’m not sure if I reacted too fast but I stuck out my hand for him to shake on the deal as he said the last syllable of his reply. He also reciprocated and stuck out his hand and we closed the deal on that piece. I was stoked! Jackie replied, “no worries.” But I read in her facial expressions that she was interested in that piece. Or at least that’s what I saw. Well now that I realized the rafters ran parallel to the wall, I had to install the cross beams on same wall where of the garage door opens and closes. Not a problem. Yeah right! As most houses, there are some things that make you scratch your head and rhetorically ask yourself, “why would they build it like that?” You see I would imagine that there would be a rafter where the walls and the ceiling meets. But no! That’s too logical. My original design called for three lag screws for each of the four foot cross planks. Maybe it’s overkill, but I really don’t want the shelving to fall. Well it turns out, I could not attach the the third lag screw as there was nothing to secure it to where the walls and ceiling meet. After tightly securing the other two lags through the cross beam plank, the 3/4″ dry wall, and into the rafter, I did a pull test. Although there were only two lag screws, the plank did not budge. Each hanging shelving unit requires two planks. I measure out 45″ from the center of the newly installed plank. That would be the center of the second plank. The installation of the second plank went much smoother and quicker than the first plank. Four hours into the project, I had two planks installed. Whoop whoop! I’m only two hours behind my original estimate. Looking at the pictures, I installed the first post into the plank, then the second went, the the stabilizing bar that attaches to the two posts. Yeah! One side hung. Another 30 minutes, I had the two remaining posts hung and the stabilizing bar attached. Another 30 minutes, I had the 3-piece base attached between the two stabilizing bars. The final screws were tightened and the storage shelving was ready for the items that would lead be there. The lucky items are my crab pots and the associated rigging. This one unit took nearly six hours from design to actually storing my crabbing equipment. So the other 6 will get installed piecemeal as I find the time…but hopefully before my one year anniversary of owning my home.